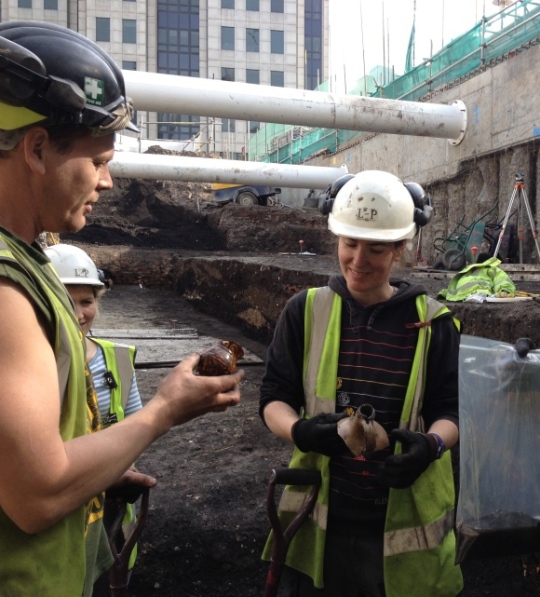 CITE AS: Chiz Harward, "Levelling the land: the infilling of the City Ditch, 1600 – 1760," in 100 Minories, March 15, 2015, https://100minories.lparchaeology.com/levelling-the-land-the-infilling-of-the-city-ditch-1600-1760/ [Date Accessed: April 23, 2019]. 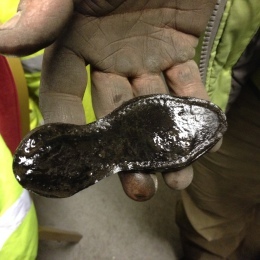 17th Century child’s leather shoe sole. Finely decorated tin glazed pedestal bowl. 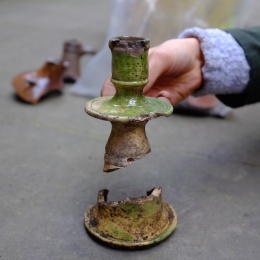 The site of 100 Minories lies between the Roman and medieval city wall and the street of Minories. For much of the Roman and later periods this area was occupied by the large (and very wide) ditch that surrounded the wall, the ditch was cleaned out and re-dug several times over the centuries however by about 1600 the City Ditch was much reduced in size and finally was entirely infilled leaving only a small ditch or open sewer running beside the wall. View of infilled City Ditch; the baulk is composed of refuse deposits dumped within the original area of the ditch, to the right is the latest excavated course of the City Ditch. 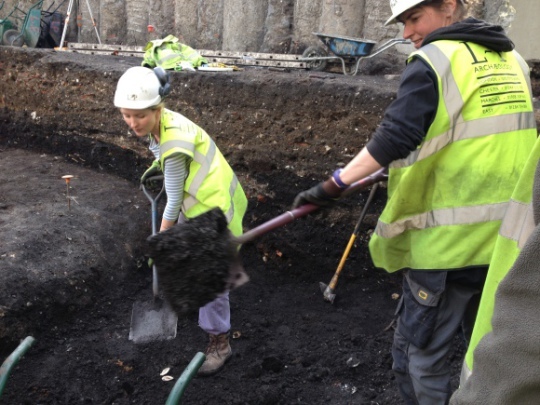 Excavation of Post-Medieval ditch infill. 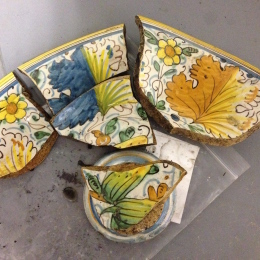 Archaeologists Manca Kavcic and Audrey Charvet excavate. The area of the former ditch was used as a dump for huge quantities of refuse and waste materials, which built up over time to a depth of several metres. 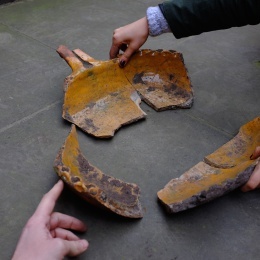 The refuse includes large quantities of domestic pottery, clay pipes and smaller animal bones within a matrix of clinker, ash and silty sand that suggests this may be largely domestic rubbish and street sweepings from within the City, although discrete dumps of oyster shells, and industrial waste suggest that this was occasionally brought in by the cartload. 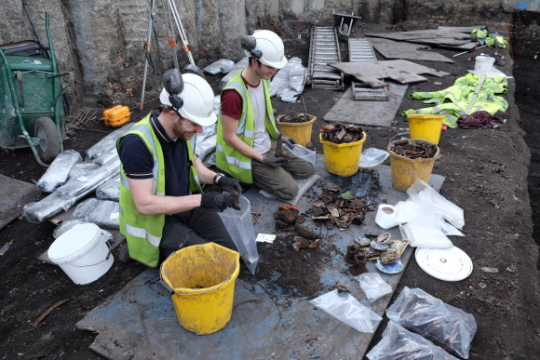 The refuse appears to have been picked over and useful materials taken for reuse, bulk ‘whole earth’ samples taken at different points within the sequence of dumping will tell us more about what was dumped -and just as importantly what was not. 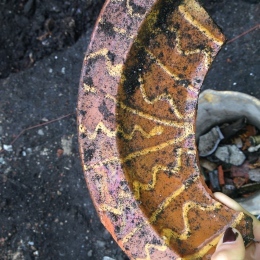 Pottery found in ditch infill. Bellarmine and Metropolitan Slipware jug. Sorting through finds. Archaeologists Tom Swannick and Tom Moore. 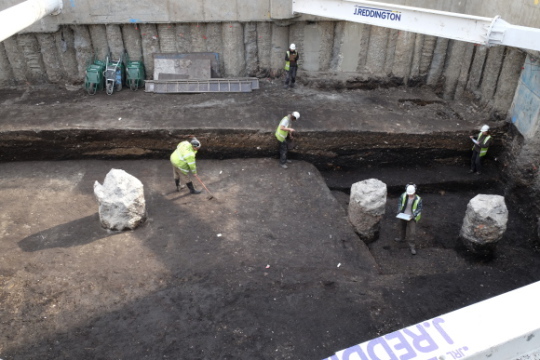 The area of the infilled ditch lay to the rear of buildings on the west side of Minories and appears to have been somewhat of a ‘no-man’s land’, a large and well-preserved timber-lined pit is one of the few structures located within the excavated area before the later 17th century. 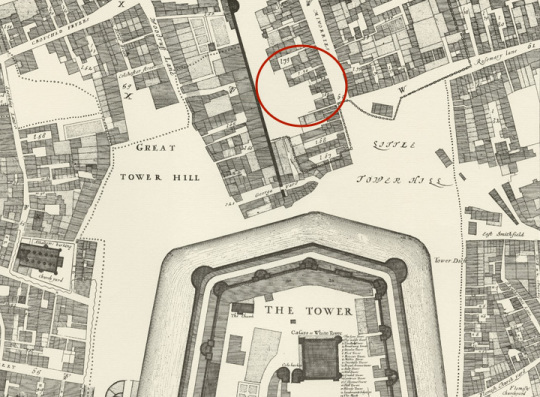 Ogilby and Morgan’s map of 1673 shows walled yards and buildings gradually encroaching onto the blank white space of the former ditch and the excavated evidence backs up this picture of relatively under-developed open spaces with brick garden walls, cobbled paths, a brick-floored cellar and a sunken brick building with a curious sloping cobbled floor. All of this was cleared for Dance’s Crescent development in the 1760s and the City Ditch was finally wiped from the map and lost under the Georgian streets. Ogilby and Morgan map of 1673 shows walled yards and buildings gradually encroaching onto the blank white space of the former ditch. Haiward and Gasoyne -‘A true and exact draught of the Tower Liberties, survey’d in the year 1597′. Engraved 1742.